Sarfaraz Naushad Khan (born 22 October 1997) is an Indian cricketer who plays for Uttar Pradesh cricket team and Royal Challengers Bangalore. An aggressive right-handed batsman, Khan played for the India Under-19 cricket team at the 2014 & 2016 ICC Under-19 Cricket World Cup.He is also the most (7) 50+ scorer in the tournament history. His father is a cricket coach. 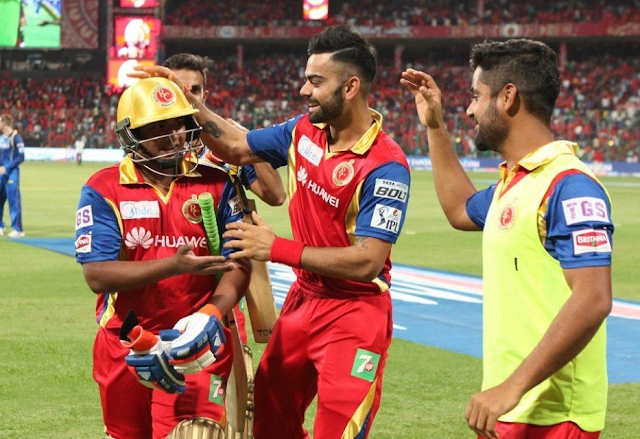 In July 2015, it was announced that Sarfaraz will join Uttar Pradesh ahead of the 2015-16 domestic season as his father hails from Azamgarh and was in talks with Rajiv Shukla, the Uttar Pradesh Cricket Association secretary for the transfer. Sarfaraz Khan rose to prominence when, aged 12, he broke the record for the highest score in the Harris Shield inter-school tournament, making 439 for Rizvi Springfield in an innings that featured 56 fours and 12 sixes. However, prior to his introduction to the global scene, Sarfaraz was suspended on charges of fudging his age by the Mumbai Cricket Association, before the board eventually accepted the results of an advanced test. After an exceptional season for the Mumbai Under-19 team, Sarfaraz, who trains under the tutelage of father and coach Naushad Khan, earned a call-up for the India Under-19 quadrangular series in 2013. He responded with a match-winning 66-ball 101 while chasing against South Africa. Sarfaraz was then rewarded with a spot in the India squad for the Under-19 World Cup in UAE in 2014. Having scored 211 runs in six games at an average of 70.33, Sarfaraz was set for his transformation to the next level. In 2015, Royal Challengers Bangalore bought him for INR 50 lakhs, and he soon became the youngest player to play in the IPL. A year later, Sarfaraz finished as the second-highest run-scorer in the Under-19 World Cup in Bangladesh, with 355 runs from six matches, often rescuing India from faltering starts. Sarfaraz left Mumbai for Uttar Pradesh in the 2015-16 domestic season. In IPL-11 he was retained by RCB for 17 crore.